Is this the Autumn of my life? 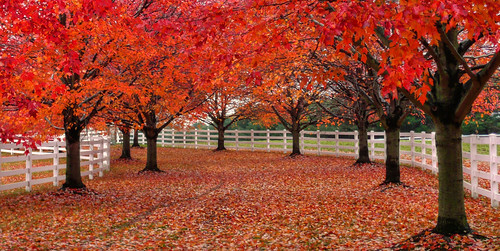 Red trees, LWPF, & a path, originally uploaded by joiseyshowaa. Since my daughter announced her pregnancy at the beginning of the year, this question has kept coming back to me. Stereotype images flashing through my mind of a grey-haired woman, sitting in her rocking chair, knitting, suggest so. However having barely reached my mid thirties, when she told me, seemed to suggest something different. When autumn has come around before, I’ve often thought of these things, about how things die to give way for something new, the leaves fall and die, fall to the ground and provide nutrients for what’s to come in the spring. I’ve wondered about the grieving of this process and my need to grieve what is now gone, as well as celebrate what remains and look forward to what’s to come. What is gone is a 2 generational relationship between my daughter and myself where I’ve seen my “job” as showing and introducing her to the world as one who (possibly) knows more. Now exists a 3 generational relationship, where although my daughter still looks to me for guidance, I strive to acknowledge her knowledge as a mother, someone who’s making decisions for her own offspring based on her own life experiences, thoughts, beliefs, ideals and values. What is developing and being looked forward to is developing and forming this new relationship with my Granddaughter and the things that we’ll explore, share and experience together. When my daughter was little, we used to go to out to parks and places where the autumn leaves had fallen and stamp out tunes in the leaves. Something I’d forgotten until my daughter did it last week as we walked through the park pushing the pushchair. So, how thrilled and in celebration I am about the prospect of my daughter passing onto her daughter something fun and special that we had shared in the past and at the same time, sad that we won’t share those things together in the same way. The birth of her own child truly signified to me that she’s not “my little girl” anymore, and I’m no longer the “most important” person in her life. Her daughter rightfully is. So, is this the autumn of my life? I think that this is up to me to decide and to live in whichever season of life fits the truth of who I am and where I am in my life. And I decide that this is the start of my summer! Prosperity X on I’ll tell you what I want, what I really, really want…. Roulettestrategie on I’ll tell you what I want, what I really, really want….